We are today's stop on the Blood Jewel Book Tour. This is the first stop we have on the tour presented by These Paper Worlds Book Blog Tours. 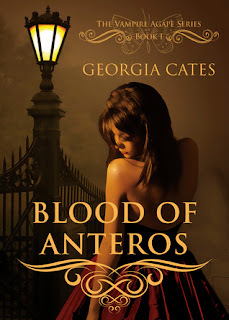 We have a review of Blood of Anteros, Book One of The Vampire Agape series by Georgia Cates. Next week, we will post our review of the second book in the series, Blood Jewel. Blurb: "I was tantalized by the mystery of her. The leech inside me came out to find prey, but found none in this enigmatic girl. The close proximity of her essence didn’t entice the monster within, so what did that make her? I had more questions than answers, but one thing was unmistakable; although she released me from her embrace, her hold on me remained." Curry Brennan was born a human and was killed and turned into a vampire by his creator, an obsessed bloodsucker named Marsala. For over 130 years, he was her captive, forced to live with her and endure her murdering innocent people and children. On the day he decides to end his life is when fate gives him the opportunity to begin again. Without Marsala. Returning to his childhood home which he built, he becomes a boarder to an older couple. When he meets their granddaughter, Chansey, a college student who works at a local casino, Curry's human tendencies begin to show themselves. There is something about this human girl that intrigues him, calls to him, and he soon finds out what it is and why. Chansey is more than his soulmate, she has the blood of a God in her, and she is his Agape. In essence, they were destined for each other. Her birth released his bond to Marsala. Once Curry lets Chansey know about himself and what she is, he swears to protect her at whatever cost. When Curry believes his biggest obstacle to keeping Chansey safe is by keeping Marsala away, he finds out he was wrong. Others know about his Agape and they want her for their coven. 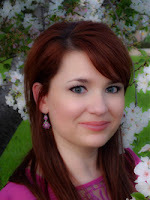 Georgia Cates has created an intriguing premise and crafted an even more fascinating mythology which surprised me--as a vampire fan--and kept me reading. Having Curry narrate gave the story an old fashioned perspective since he is a 160 year old vampire. His way of thinking is a bit more drawn out and his manner of speech formal. What I found interesting were his thoughts--and we're privy to many since this is first person POV--sounded more modern than old. Chansey was cute and the opposite of Curry but she drew him in with her bubbly personality and down to earth charm. Her admittance to him about her dream with her sister was touching and added an extra layer of depth to an already rich story. She brings youthful vitality and romance to balance Curry's archaic ways and makes him a better individual too. The beginning was a bit slow moving for me but once Chansey was introduced, the pace picked up and I had to see what would happen to the couple. There were also a few instances when the dialogue felt a bit unrealistic, but not enough to make me give up on the story. Blood of Anteros is an intriguing read and I definitely want to see what happens to this couple in the next book. I am a wife, mother of two daughters and a labor and delivery nurse. I have recently added Paranormal Romance Writer to my list of things to keep be busy, but I am ecstatic to release my debut novel, Blood of Anteros, the first book in The Vampire Agápe Series.